Bottom line: if you are speaking to a group of gardeners in Williamsburg, you better be prepared to toss in a bit of history so here goes; as the early settlers began to colonize these shores, herbs were among the most important cargo. Herbs for healing, herbs to improve the flavor a what would be considered a very bland diet, and herbs to disguise the smells that were a part of poor sanitation as well as spoilage. Herbs were vital to the establishment of a thriving colony. 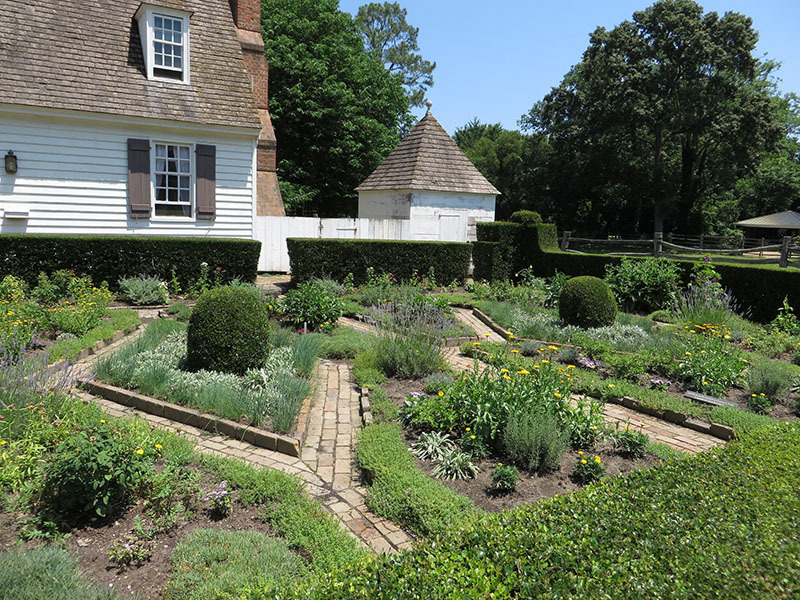 And, if you have ever had the pleasure of strolling through Colonial Williamsburg, you will see that these early colonists were heavily influenced by European gardening designs, known for geometric symmetry. Tamed. Trimmed. Contained. Maybe that was the only thing that they could control in the challenging new world. Herbs, flowers and vegetables were all grown together in what was referred to as a ‘kitchen garden’, and quite similar to what we now refer to as intensive gardening. 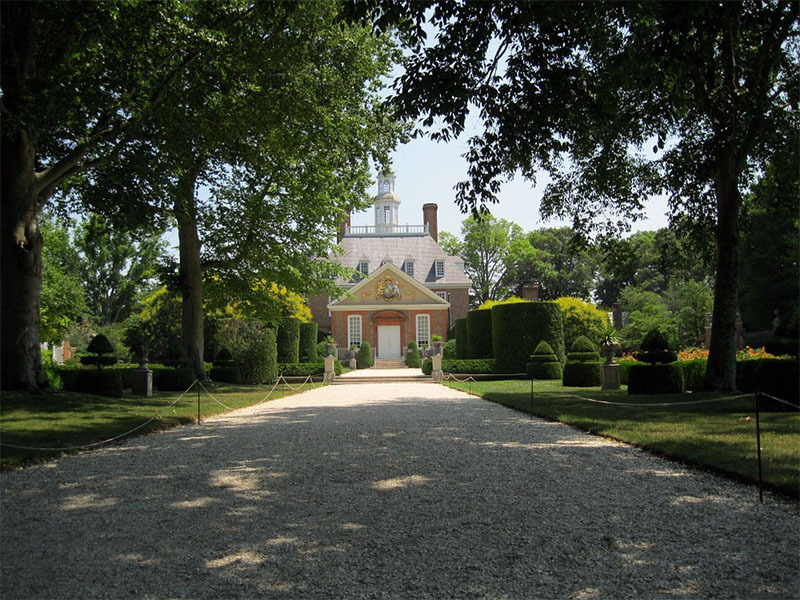 These gardens were always planted close to the home, and usually surrounded by a hedge or fencing. The variety of herbs found in these home gardens was impressive, and used for cooking, medicinal purposes, dyes and ‘air freshening’. Adding to the variety brought from abroad, this ‘new world’ was filled with its own plant world and native peoples with their own knowledge of their uses. There were a few transplants that recognized the value of this native knowledge, and worked to make sure that this valuable information was recorded. Thankfully, Dr. Benjamin Smith Barton, a respected physician in Philadelphia, recognized this created an invaluable work known as Collections for an Essay towards a Materia Medica of the United States. His work launched a great deal of interest in these natives. 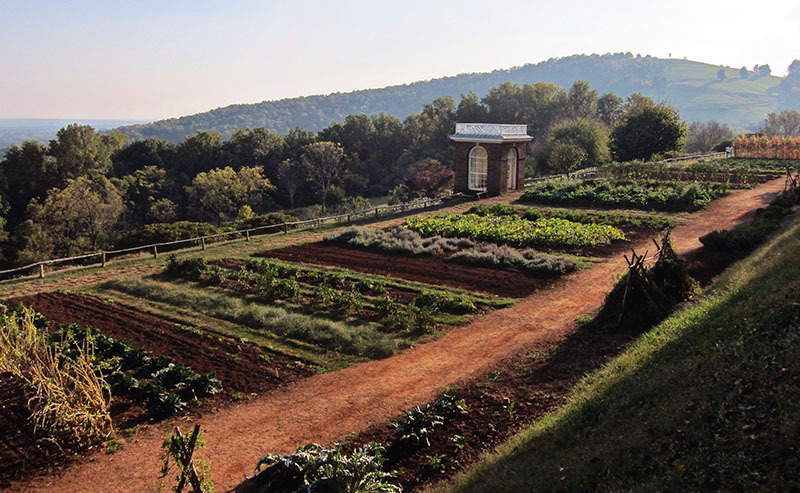 An hour and change west of our little operation is the home of Thomas Jefferson, Monticello. He was a true horticulturalist, as well as an epicurean. Being the parent of 3 children, I’ve been on many a field trip to this magnificent home, and always wander off to the 1,000 foot terraced kitchen garden where the 26 herbs he regularly grew are still growing well. This was a source of food, as well as his lab. The Jeffersonian Era was the heyday for herbal medicine, and was gradually overtaken by the creation of synthetic duplicates. The birth of the pharmaceutical industry didn’t end our interest in herbs, and it is interesting to note that 25% or more of pharmaceuticals contain active ingredients from plants. There is a growing interest in the use of herbal remedies that harken back to the colonial period. However, a note of caution: there is no question that herbs have been relied on throughout the history of mankind to heal, resist infection, relieve pain, reduce fever – very important to relieve and reduce human suffering. But, the proper use of herbs in medicine requires knowledge and training. I am always amazed by these stories of misuse, leading to serious injury and even death. Deadly Nightshade is… deadly. 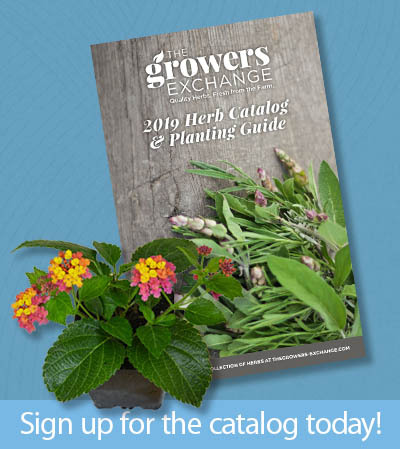 I’ve been growing herbs for over 40 years, and I still have a lot to learn! Additionally, be aware of any false claims! An interesting article found in Rodale’s Illustrated Encyclopedia of Herbs discusses the era of ‘patented medicines’ – think peddlers and ‘snakeoil’. These patents were easy to come by, and didn’t require any proof that they worked, only that they were unique. Usually a concoction of herbs, and a dose of alcohol, opium, cocaine or marijuana for that added healing kick. Generally, these tinctures, tonics, and liniments had no medicinal value but a few notables actually live on: Milk of Magnesia, Vicks Vaporub as well as BC Powder and Bayer Aspirin! So many of our loyal customers are using herbs for medicinal purposes, and all we ask is that you are careful and considered in your use. We are not providing our customers with medical advice, therefore consult a doctor or reputable herbalist before using any herb for medical purposes. Briscoe, hearing from you in your wonderfully personal style always makes my day! Thank you. I’m happy to have found The Herb Exchange! Hey: Thanks for the nice compliment! We try to keep writing but it’s pretty challenging the closer we get to spring! We live in Lynchburg, Va now but my husband and our youngest went to W&M. My parents lived in Chester and we used to do a lot of Plantation tours. 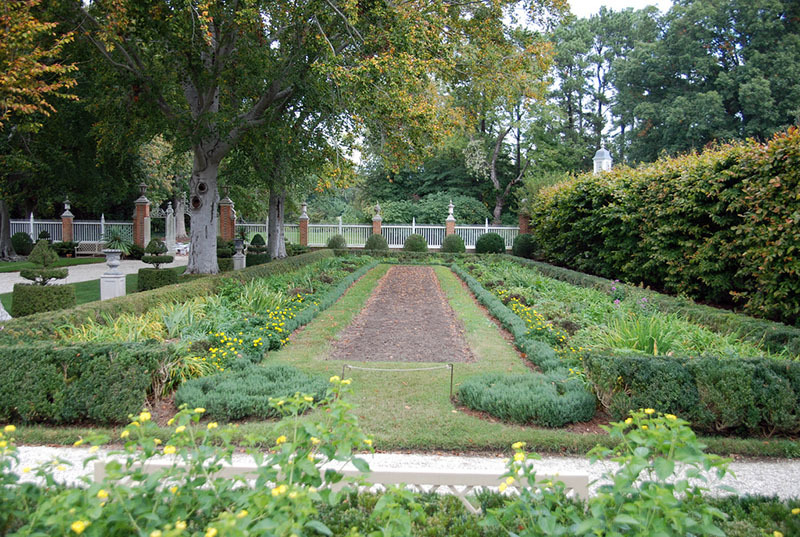 Reading your newsletter reminded me of those fun visits to Berkeley & Shirley Plantations. Realmente es una grata sorpresa encontraros con ésa noble afición por el cultivo de hierbas medicinales, de cocina, saborizantes y de ornamentales. Por favor envíeme CATÁLOGO DE PLANTAS MEDICINALES. En mi país El Perú tenemos grandiosas reservas de medicina tradicional desde nuestras culturas ancestrales como El Imperio Incaico que en su apogeo abarco gran parte del territorio de Sud América. Seria muy feliz intercambiando información y de ser posible establecer negocio de nuestra flora medicinal. Which herbs are best for attracting bees and butterflies? I bought a type of basil one year and it swarmed with bees all summer. The next year I bought one and they ignored it. It must have a been a different variety. Is there any way I can contact you through E-Mail?